I was surprise by the interest in the last post, and I think a continuation of the topic using new material is in order. As side notes apparently I got upgraded on Lubos scale to "confused", so I hope I finally got past the misunderstanding that I am a closet admirer of classical physics which was really absurd since I am deriving quantum mechanics from physical principles. Currently I am reading Jean Bricmont's new book Making Sense of Quantum Mechanics which is of course written from the point of view of Bohmian interpretation - Bricmont is well known Bohmian supporter- and I will report on my read after I will be done. Now back on local realism. In an interferometer one cannot locate the path a particle is traveling because the "which way information" destroys the interference. Moreover, by adjusting the lengths of the two paths, one can tune the interference in such a way that only one output will collect all the particles, and the other output will record a null result. So what would happen if we combine two such interferometers in such a way that they touch at point P as in the picture below? This is the setup of Lucien Hardy's thought experiment and the experiment has one more twist: in one interferometer we inject electrons, while in the other we inject their anti-particle: the positrons. If the two interferometers are not touching, they are tuned in such a way that all the particles arrive at the "c" detectors , and none at the "d" detectors -c for constructive interference, d for destructive interference-. 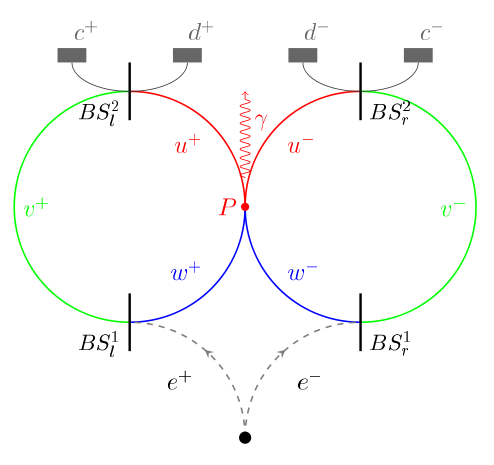 Suppose now that the loops touch at point P. If the particle from the right loop goes through P it blocks the w+/u+ path of the particle in the left interferometer and the left interferometer superposition is prevented as well. As a result, now the left particle can be detected at the d+ detector. So far this is nothing fancier than the interferometer discussion from "Where is Waldo?". But now comes the catch. If we use electrons and positrons, when they both arrive at P we will have an annihilation resulting in a photon represented as \(\gamma\) in the picture above. The key question for local realists is: can we detect at the same time the positron at d+ and the electron at d- ? When we operate the interferometers without touching this can only happen in the case of a blocked path which kills the interference phenomena. However, in the touching case, when both paths are blocked you get anihilation and a gamma photon. Any local realistic description of the experiment cannot predict simultaneous detection of the electron and positron at d-, and d+. Still this is allowed to occur by quantum mechanics. This thought experiment is independent of initial conditions and hence is free of the superdeterminism loophole. The challenge for the local realist is to explain why sometimes we get simultaneous detection at detectors d+/d- when the interferometers paths are touching at P, and never when the interferometers do not touch. This is a bit less quantitative text than your GHZM one, or my Hardy's text. But have you looked what e.g. Bricmont says about it - on page 219? He offers just a quote by Sheldon Goldstein saying that the "problem itself is a problem" and there's no inconsistency between the 4 statements because they're 4 different ensembles. This is such clear content-free fog - and a display of an attitude that clearly prevents them from predicting *anything*, they may just insult key physicists and spread nonsense and fog - that I am flabbergasted that you're willing to admit that you don't understand it. Your annihilation picture shows some bugs of the Bohmian crackpottery in particular. By adding the guiding wave, Bohmian mechanics "emulates" the relative phases for a particle at one place and another place. But it still *objectively* has a certain number of particles - which have some locations. This is in conflict with how it works in Nature - and quantum mechanics - where one must use superpositions also for adding states that contain a different number of particles. So for example, all loop corrections in quantum field theory mean that the intermediate states are superpositions of a different number of particles (the extra internal propagators are particles that are either there in the intermediate state, or not, and the options interfere with each other and with simpler diagrams). It's no coincidence that you won't find the word "loop" in the whole Bricmont book. It's obvious that his philosophy fundamentally disagrees with the very existence of loops. But in actual non-crackpot physics, effects that we call "loop corrections in Feynman diagrams" today were already computed in the 1930s. This is the *actual* physics. One produces quantitative predictions and they're experimentally verified - in the case of electron's magnetic moment, with the accuracy of 15 digits. Crackpots such as Bricmont don't give a damn. They are doing political activism of a sort, not science. They have superlousy standards on everything that has something to do with testing of their theories. A petty stupid inconsistent insult is enough - in their view - to "debunk" all of quantum mechanics and everything that has been done in the actual physics throughout the 20th century; and a simple incomprehensible excuse incompatible with any calculational framework is enough - in their view - to defend self-evident contradictions between experimental facts and their pseudoscientific ideology. I have never heard of this experiment before so it took me about half an hour to spot the weak point. The somehow cryptic image with those circles did not help. The good quality wine on my table didn't help either. I was somewhat surprised by the absence of words like "free choice" or "free will" which are used in most arguments against local realism, obviously rendering them fallacious (circular reasoning). The fallacy involved in the argument based on Hardy's Paradox is not about logic but about physics. Just like in the case of the iconic double slit experiment, the model chosen to represent local realism is not an example of a classical field theory, (where the particle's path depends on the distribution of all field sources, both close and far away) but the naive "bullets" or "billiard ball" model where particles move in straight lines until they bump into something else. So let's present the correct picture of this experiment from the point of view of local realism. 1. When the experiment is performed with an electron-only source and the electron is not disturbed it is found at detector c-. 2. When the experiment is performed with an electron-only source and the electron is disturbed it is found at detector d-. 1. When the experiment is performed with a positron-only source and the positron is not disturbed it is found at detector c+. 2. When the experiment is performed with a positron-only source and the positron is disturbed it is found at detector d+. If a "billiard balls" model is used then we should expect no detection at d-/d+ detectors when using an electron+positron source because the particles should annihilate. If a classical field model is used we cannot say anything. The experiment is different, the distribution of field sources is different, the resultant field which acts at the location of the particle is different so the path taken by the particle is different. In other words, an undisturbed electron may go to d- if an electron/positron source is used. I want to congratulate you for proving that the billiard balls model does not accurately describe the quantum world. A classical field model should be used instead. I hope you may find a few minutes to answer the questions in the previous thread. If you forgot them just tell me so I can re-post them here. I think our host wouldn't mind, as the subject (local-realism) is the same. Andrei, I have several comments. -For your number 2's only 50% of the time you get detection on "d", the other 50% is on "c". -not sure what you have in mind for a classical field description of the electron; do you now accept the wavefunction? Florin: "For your number 2's only 50% of the time you get detection on "d", the other 50% is on "c"." OK, I stand corrected. If the particle is disturbed it may also go to c. How is this supposed to invalidate my argument? 1. It has a non-local behavior. 2. It does not exist in our 3+1 dimensions. I was surprised Lubos interacted that long with you last time; I guess he tried to pinpoint your exact reason to support local realism. I don't think he will reply to you anymore. Now regarding your argument, I only have to recall all your prior points and serve them back to you. The challenge now for you is to explain the point particle behavior of the electron when is detected and come up with a consistent story of this with what you are now proposing. Again, it can't be done. For example, yesterday, I banned a guy named Justin Glick - he also thanked me for being banned by e-mail - after many years in which pretty much every comment of his was either some frustratingly empty yet hostile attack on string theory or (proper, non-realist) quantum mechanics, etc. With the hindsight, the aging caused just by this single has had to be huge. I don't have this defense here so it's plausible that when someone like Andrei irritates me sufficiently or seems to need some obvious answer - that would be helpful if the other side were listening (which, I am sure, isn't really Andrei's case, but I can never *quite* reconcile myself with this fact) - I will respond to Andrei again. There's no law of physics that could stop me from doing so. Dear Lubos, I will not ban anyone here except for gross violations. If you noticed my style, last time I had fewer exchanges than you did and I kept emphasizing the burden of proof responsibility because there is a community of experts who share a common consensus and if you go against it, it your duty to convince the world that your claims are the valid ones. Sometimes the community is wrong and then you need to look for decisive arguments of why they are wrong. Those arguments need to be accepted by the community. This does not mean I will attempt to convince everyone. There are individuals who know full well they are supporting a wrong cause but keep doing it for power and money. There are also honest persons who are willing to change their point of view given the right argument. The only way to know who is who is interacting with everyone. That is why burning bridges is a counterproductive strategy in my opinion. Dear Florin, science has nothing whatever to do with communities and social duties. Also, I don't respect what you refer to as a "community" as an admirable component of the scientific community, and certainly not as an autonomous one let alone one that has a monopoly over the foundational questions of QM. It is spectacularly obvious that your "community" understands quantum mechanics much less than the community of physicists who actually practice quantum mechanics in one particular discipline or another. In fact, I often think that even the formal theoretical physicists where I have belonged - despite its formally prestigious status - understands quantum mechanics less than e.g. the condensed matter physics (sub)community. It's painful but it's true. People disconnected from some kind of practical usage of these principles and rules are inclined to say some really stupid things about really elementary questions. Lubos, on 219 the discussion is on consistent histories, but indeed the weakest spot of Bohmian is on quantum field theory and this is where I am going to prove in a mathematical way the impossibility to extend Bohmian to QFT - advanced work in progress. "Work in progress" is clearly a deceptive description of the situation. There has never been any progress in that and there cannot be any progress. QFT is a controlled framework allowing one to quantitatively see that the fundamental assumptions of the Bohmian paradigm are incompatible with facts about physics. Have you read "Bohmian mechanics is incompatible with loop corrections" (Google search if necessary). If you can't understand these arguments, you shouldn't have become a physicist because you lack the basic intellectual skills for that. Work in progress means I am writing a paper on it, and I am not yet done writing it. Only proper quantum mechanics as discovered and carefully described and postulated by Heisenberg, Jordan, Born, Bohr, Dirac, and perhaps Wigner and von Neumann floats my boat - or any other boat. All the other boats have sunk to the bottom of the ocean and some people love to send microphones over there connected with speakers on the land and adjust the speakers to "really loud". Lubos interacted with me until it was obvious that he will lose the debate. Then he preferred to run to his own blog and ridicule a straw-man version of my argument. He didn't have the courage to copy/paste my argument from here (so that his readers could see how stupid I really am), he thought it was safer to put his ridiculous words in my mouth. This says a lot about his character but it is irrelevant to our discussion so, with your permission I will repost my argument here in the hope you will continue by either refuting it or accepting it as valid. We have a pair of entangled, spin-1/2 particles. One is in the possession of Alice, the other one is very far away in the possession of the second observer, Bob. At a certain time Alice measures the spin of her particle along X and finds -1/2. A long time after that Bob will also measure the spin of his particle, also on X. 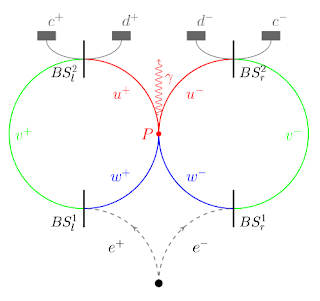 Before the measurement, the system (which includes both particles) is in a superposition of the states (Alice: -1/2, Bob: +1/2) and (Alice: +1/2, Bob: -1/2). After the measurement performed by Alice the state collapses in one of the two eigenstates. In other words, if Alice finds her particle to be -1/2 she knows that Bob will find +1/2 with probability 1. QM says that Alice's measurement determines a change. What kind of change is possible? 2 implies that no change occurred with the system itself. But after the measurement, the system is in a well-defined state (from the subjective point of view of Alice, sure) and necessarily follows that the system must have been in such a state all the time. Florin: "Now regarding your argument, I only have to recall all your prior points and serve them back to you. The challenge now for you is to explain the point particle behavior of the electron when is detected and come up with a consistent story of this with what you are now proposing. Again, it can't be done." I don't understand your request. I have never claimed that the electron is not a point particle. It is a point particle that has a charge and its motion is determined by the electric and magnetic fields (and also by the gravitational field) acting on it. "Let's say an observer at time t0 measures the spin of an electron in the z-direction to be +1/2. If I'm not mistaken, any observer who subsequently measures the z-component of that electron's spin will always get a result of +1/2, independent of whether they knew about the previous measurement. Am I right so far?" I think it is interesting to analyze the answer because it indirectly answers my argument above. So what did Lubos answer? "Dear ybretty, first, if an observer measures "spin up" at t0, and the spin is conserved, it will be "spin up" later, too. However, in general, the spin is not conserved. For example, in a magnetic field pointing along any non-z (non-vertical) axis, the spin will rotate around the axis like a gyroscope (precession)." This is true but completely irrelevant to the question. The question was explicitly about a measurement along the same axis. "Second, I would probably have to answer "no" to your "am I right so far" because you're mixing observers. If observer A measures something, he has his own perspective, and other observers such as the observer B just haven't "automatically" measured the same thing. So for them (e.g. for observer B) to be sure that the "spin is up", they have to measure the spin - directly or indirectly - themselves. Observer B may measure the spin indirectly by asking the observer A although it's a bit inaccurate measurement because observer A may lie etc." So, some observers know that the spin is +1/2, some don't. If they care to check they will invariably find the result +1/2. This is generally true about every fact about the world. Some "observers" do not know where Paris is. Should we remove the information that Paris is in France from all books because it does not correspond to the "perspective" of those "observers"? Should we write instead that every one should go and see where Paris is and keep that information for himself because we cannot say anything objectively about its location? And who cares about the perspective of the observer after all? There is nothing in the postulates of QM about how many observers there are, if they agree or not with each other, whatever. The Born rule says the system will be found in an eigenstate after the measurement takes place. It says nothing about the fact that the eigenstate exists only from the point of view of the observer that performed the measurement. This is a pure invention. The system itself is in an eigenstate and it remains as such for all observers. This can be experimentaly verified as well. If, from the point of view of, say, 1000 observers (who did not measure the spin on Z) the system is still in superposition it follows that about 500 of them should get -1/2. but this obviously cannot happen. If they compare the results after measurement they will conclude that they were simply wrong in giving a 50% chance to the -1/2 result. Quantum mechanics is a theory about physics, about electrons, atoms, molecules. It is not about observers, about their brains or about how information changes in those brains. The non-realist is inventing all this observer-related stuff in the same way the Everettian invents parallel universes. They are nowhere to be found in the QM's postulates and their only purpose is to satisfy some illogical beliefs. The spin of the particle on Z has been +1/2 all along and all observers find that value. Some of them knew the value, some of them did not. Andrei: "The question was explicitly about a measurement along the same axis." - what you're clearly incapable of understanding is that the spin along the same axis is not conserved in general. For example, in every atom, the spin vector S - every single component of it - is changing with time due to the L*S spin-orbital interaction. Andrei: "So, some observers know that the spin is +1/2, some don't." - Yes, that's indeed the very point of having observers in physics - they have different knowledge. If everyone had the same knowledge, the data would be objective and we wouldn't need to talk about the observers. It's hard to understand this simple point with your IQ of 50, right? An atom is a composite system. The total angular momentum of this system is conserved as well. The example was about a single particle so its spin must be conserved. "If everyone had the same knowledge, the data would be objective and we wouldn't need to talk about the observers." By definition, an observer must observe something. In this case they should perform a spin measurement on Z. If they do so, they will all agree that the spin is +1/2, therefore this particular property qualifies as an objective one. Everybody else is not an observer. If several people measure j_z after each other, and there's no magnetic field etc. that makes the spin non-conserved, they will agree about the value j_z, but the reason behind this agreement is *not* that the value of j_z is observer-independent. Each of the observers observes j_z at a different moment and the reason why their measurements agree with the testimony of the previous observers is the entanglement of the previous observers with the spin, created by the previous observers' measurement - not an objective character of any information. On the contrary, their purpose is to wean people from any naïve classical ideas they might cling to which might lead them into e.g. a risible assertion that, if only some perversely illogical beliefs are adopted, a clean and clear interpretation of QM results. The genuinely clean and clear interpretation of QM is that it is simply (noncommutative) probability theory applied to mechanics. Let me see if I understood your view correctly. You start with a particle in a superposition of Z-spin +1/2 and -1/2. This goes on and on and all observers just pile up in those states. "On the contrary, their purpose is to wean people from any naïve classical ideas they might cling to which might lead them into e.g. a risible assertion that, if only some perversely illogical beliefs are adopted, a clean and clear interpretation of QM results." I disagree with this implication. I think that there is no incompatibility between classical realism and QM. All arguments in favor of such a view are flawed. Usually they involve an assumption that does not make sense in a local field theory (like free-will, or independently evolving systems). My refutation of Hardy's paradox can be found above.